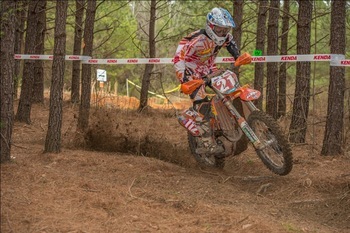 West Point, Tennessee (April 6, 2014) – FMF/KTM’s Charlie Mullins kept his win streak alive by taking his third win of the season at the Rad Dad Enduro in Westpoint, Tennessee, round number three of the 2014 Kenda AMA National Enduro Series. Win number three didn’t come quite as easily as the first two, however, as Mullins won only two of the six tests, and came under heavy pressure from N-FAB Am Pro Yamaha’s Brad Bakken and AirGroup Racing’s Nick Fahringer throughout the race. In the end, Mullins took the win by 25 seconds over Bakken, with Fahringer not far behind in third. Mullins lost his rear brakes in test one and had to settle for the ninth-best time in the test, as Maxxis/KLIM/DirtWise KTM’s Jesse Groemm got off to a quick start by posting the fastest time in the opening test. Mullins came back strong to win tests two and three and was able to build a big enough lead to last him for the rest of the day. In the meantime, Fahringer, Bakken, and Husqvarna Factory Racing’s Andrew DeLong fought over the runner-up position, with Bakken getting the upper hand early after topping test four and then holding off a late charge by Fahringer, who won the final two tests. Despite a pressure filled race, however, Mullins was able to strengthen his bid for a third national enduro title by taking a hard-fought win. Bakken emerged with the runner-up slot at the end of six tests, edging Fahringer by a mere seven seconds. Groemm ended up with fourth after a strong start, however, the New Jersey rider suffered several tip-overs in the final few tests, which cost him considerable time. After being in the mix early, DeLong suffered a hard crash in test five and eventually finished sixth, just ahead of FMF/KTM’s Mike Lafferty, who became ill during the race and was not able to hold his early pace. Factory Beta rider Cory Buttrick turned in his best ride of the year with a strong eighth, while KR4 Performance’s Shane Hufford and North Carolina’s Trevor Bollinger (Hon) rounded out the top 10. After three rounds, Mullins leads Groemm by 34 points in the series standings, with Fahringer one point behind Groemm in third. Husqvarna support rider Craig DeLong took the win in the Rekluse Expert-AA division, coming on strong in the final two tests to beat out class points leader Tyler Trammell of Georgia. Trammell held the early lead on his KTM however, loose rear spokes slowed him in the final test. Ryan Belue of Travelers Rest, South Carolina was third on an N-FAB Am Pro Yamaha. The 2014 Kenda AMA National Enduro Series resumes action on May 18th in Park Hills, Missouri, for round four of the series. For information on the series go to http://www.nationalenduro.com.